Compared to 10 percent of counties today, 32 percent of counties will be at high or extreme risk of water shortages by 2050. Projections assume continued increases in greenhouse gas emissions through 2050 and a slow decline thereafter (A1B scenario). Numbers in parentheses indicate number of counties in each category. Reprinted with permission from Roy, Sujoy B., Limin Chen, Evan H. Girvetz, Edwin P. Maurer, William B. 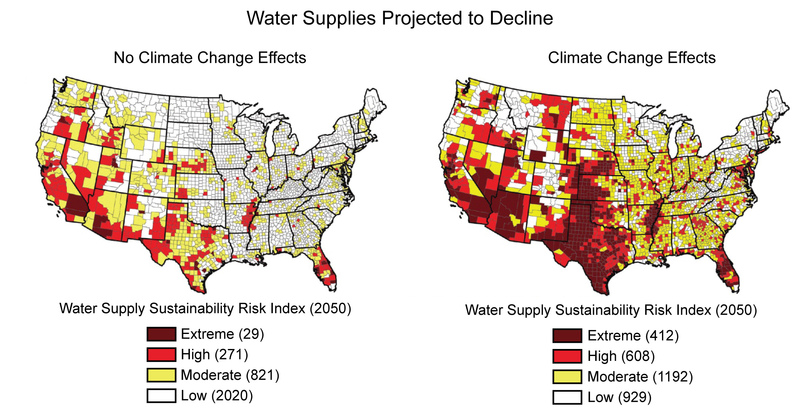 Mills, and Thomas M. Grieb, 2012: "Projecting Water Withdrawal and Supply for Future Decades in the U.S. under Climate Change Scenarios." Environmental Science & Technology, 46(5), 2545–2556, DOI: 10.1021/es2030774. Copyright 2012 American Chemical Society.